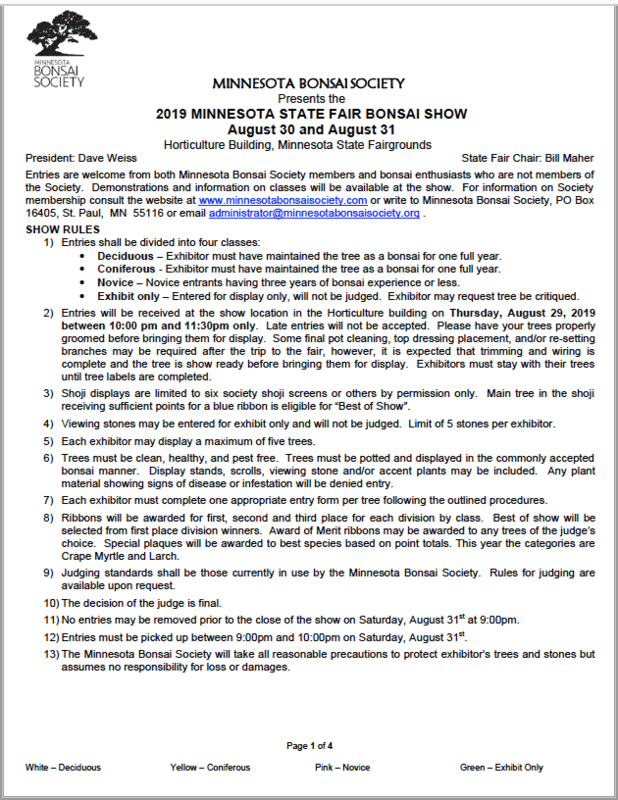 Come view our largest bonsai show at the Minnesota State Fair, where we exhibit on the Friday and Saturday of Labor Day weekend. Exhibit is free with your State Fair admission. 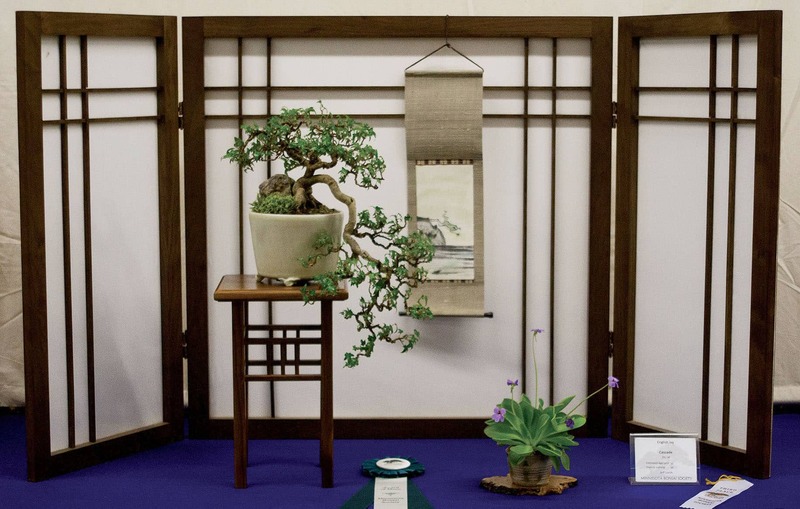 Interested in entering your bonsai into the show? This event and open to anyone wishing to exhibit, including non-members. The show is judged and critiqued by a visiting bonsai professional hired by MBS, and awards are given. A special Novice Class is open to members with fewer than three years’ experience. The judging criteria this year is the same as last year. The Classes will be Deciduous, Coniferous, Novice and Exhibit-Only. The Divisions will be Small (8” or less), Medium (greater than 8” less than 22”), Large (greater than 22”), Landscape (forest, penjing, saikei) and Shoji Display. Because of limited number of screens (only 2 of each size), you will need to contact Bill Maher to reserve one. Stones are welcome, but will not be judged this year. Exhibitors are encouraged to bring stands and accents for displaying trees. Each member is limited to exhibiting five trees. Trees and stones must be delivered to the HORTICULTURE building on Thursday night after 10 pm and before 11:00 pm. Exhibitors should stay with their trees until their entries are tagged and labeled. Exhibitors and members are highly encouraged to help with show set up. Trees are delivered through the HORTICULTURE gate on the south side of the fairgrounds after fair closing at 10 pm. Admission will not be charged to those who are delivering and /or picking up trees between 9:00 pm – 11:00 pm with proper parking pass on your vehicles, which will be supplied to exhibitors and helper with set up and tear down. Trees must be picked up Saturday evening at 9:00 pm – 10:00 pm. All society members are encouraged to participate in this exciting show. It is a great way to get to know other society members, to learn more about bonsai and to join together in sharing the beauty of bonsai to all who visit the exhibit. The first part of this exciting process that needs volunteers is to help load the truck on Thursday afternoon (8/29/2019). Then, the set-up of our show occurs after 10pm on Thursday evening until set up is finished. We need volunteers to staff the show during the two day (8/30 and 8/31) MBS exhibit. Shifts on the days of the show are: 9 am -12 pm, 11:30 am -3 pm, 2:30 pm-6:00 pm and 5:30 pm-9:00 pm on both days. Then we need volunteers to help take down the show on Saturday evening (8/31). To complete the event, we need volunteers to help unload the truck on Sunday, (9/1). Remember as a State Fair volunteer you will receive a free fair ticket, a parking pass to the HORT LOT (if you get there when space is available), bottled water during your shift and a lot of self-satisfaction in participating in a great show! MBS is also pleased to announce that the society will once again have an informal critique of the show on Friday night from 9:00 PM to 10:00 PM by our visiting judge, Tyler Sherrod. During the critique, Tyler will be discussing various trees and displays, describing what makes them good/successful and what could possibly be improved. It is an excellent opportunity to learn what the judge is thinking and what can be done in the future to improve your trees and displays. However, there is no free entrance into the fair for the critique so if you decide only to attend the critique that night, you will need to pay for a State Fair ticket and parking, unless you are working a shift that day and can re-enter the fair or stay after your shift. Sign up sheets and Tree Registration Forms will also be available at the General Meetings this summer. If you have questions regarding volunteering or signing up to exhibit please, email Bill Maher at W_Maher@msn.com. Looking forward to seeing everyone at the fair!! !